This container is for everyone out there that has already tried scum off and knows how well it works. If you are looking for a smaller size, then click here to see the 16 oz. Scum Off. This large container will allow you to get more of the cleaner you love for an even lower price. This natural tub and tile cleaner has proven to be one of the safest and most effective cleaners available. It works better than most every traditional cleaner, but it doesn't have any of the dangerous stuff that makes using those cleaners risky and annoying. No harsh chemicals means no toxic fumes to breathe, no sticky residue, no bleaching of washcloths and clothes, and no risk of damaging delicate or expensive surfaces. This cleaner does not work like traditional ones do, and it only contains the safest and most natural ingredients. This makes it safe for any tub or shower surface, and completely safe for use without gloves or a gas mask. The best part about Scum Off though is how well it works and how easy it is to use. It actually produces better results than some of the top bathroom cleaners available in stores, and allows you to achieve those results with very little effort and no harsh chemicals. It is an enzyme cleaner so basically it does the scrubbing for you. Just apply the cleaner to every surface in your shower or bath tub and let it sit there for 10-20 minutes. While it sits on there it is breaking apart the dirt and build up and lifting it off the surface. This is what you would do by scrubbing with your regular tub and tile cleaner, but Scum Off does all of the hard work for you. Once the Scum Off has time to work, it is as easy as going back over it with a damp sponge to remove the cleaner and all of that dirt, hard water, soap scum and everything else too. You will be amazed at how easy it is to achieve great results with this cleaner. 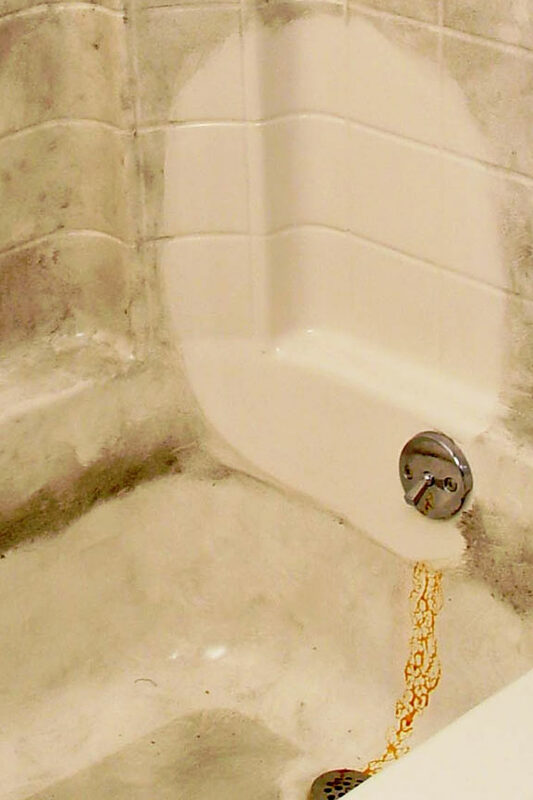 Over time Scum Off will remove the old layers of dirt and residue left behind by other cleaners which will make cleaning your tub even easier. As you use it you will find that it takes less and less time to get the same results. This all-natural gel cleaner easily sticks to your shower walls, glass doors and tubs and it makes cleaning your shower a breeze. Once applied, it goes straight to work breaking down all of the build-up on your bathroom surfaces. Scum Off is strong enough for all of your toughest cleaning chores, yet completely biodegradable and environmentally safe. Wet your whole shower down first. Once wet, apply the cleaner all over. Then just let the cleaner sit for anywhere from 10 minutes to a full hour. This gives the Scum Off time to work and is really the most important step to achieving great results with this cleaner. It begins breaking down all of the build-up, making it easy to wipe clean. After you have waited for the cleaner to work, just come back with a scrub sponge and a small amount of cleaner to wipe it clean. All of the dirt and grime will be floated off the surface and will wipe right off to be rinsed down the drain. Discover the easiest way to clean your tub or shower. It takes less effort, and you have the benefit of it being non-toxic. You will never have to worry about a harsh smell, damaging your skin, or compromising the health of family members when you clean with Scum Off. Discover a greener way to clean. Get a free Non-Abrasive Scrubbing Sponge with every order so you can get to work right away! Order Yours Today! Clean without scrubbing! This is a highly concentrated, environmentally safe (phosphate-free) organic solvent for all your shower and tub cleaning needs. Use it on tile, grout, porcelain, chrome, glass and more. Order Yours Today! I was impressed with what I saw at the home show and on you tube yet even though I followed directions to a tee I saw no results at all that didn't come from my own heavy scrubbing. I tried it both on tile and the bathtub.I had to resort to my usual combination of chemical cleansers and lots of elbow grease. I have been using it as the daily spray too and have not seen any of the effects of water sheeting off the tile wall like the bottle talked about. I don't know how they get it to work on line and in shows but I saw no cleaning results at my home. The service at simply good was great. We have used Scum Off for over 6 years now and love it. We spray down the shower with it every day. Our shower us 18 years old and it looks like new. I love this stuff. I takes off all of the water stains from my shower doors. This large bottle last me about 2 years. Product worked wonders for my hard water and scrum laden shower doors and tiles. Will purchase this product again. Very pleased with the results. We have made two applications and the shower doors are very clean. It works! In spite of some silly complaints, I bought this stuff because I believed the seller's claims. Sure happy I did! The previous owners lived here six years and never cleaned the shower glass. I really didn't have time to leave it on as long as they recommend, so it took a bit longer - but IT WORKS! I applied it to the wet glass, showered, then rinsed it off. I just ordered this on 12/19, and even in this short time the glass is now clean as new! Don't hesitate to buy this wonder cleaner! Even the fiberglass is much cleaner and less slippery! This product works very well. I would recommend this. How many products these days are as they've been represented? THIS IS!! WOW!! Sorry, CLR. This product is superior to all others! And not harmful to us or our environment. Thank you, Simply Good Stuff! I'm just sorry I did not buy a bigger container! This is a SCAM!!! I guarantee that all the reviews they have that are 4 or 5 stars are from the company itself. This product LITERALLY does NOTHING. I purchased this at the San Diego County Fair and used it over and over again. Exactly as the directions indicate...over and over again. NO EFFECT of any kind on the very surfaces it says it cleans. They might as well put water in this bottle and sell it...wait, water would work better! CONSUMER ALIERT! SCAM! Shower Soap and Hardwater Scum gone! This product works better than anything I have tried to date, and I'm 66! It doesn't have a harsh chemical smell, comes in condensed form so I'm not paying to have water shipped to me, and makes scrubbing the hard water deposits easy, especially with the non-scratch scrubber it comes with. I'm 100% satisfied! Seems to be excellent on tile and porcelain. Have not tried it yet on glass. The cleanser did an okay job, but I had 15+ years of scum on my shower. We spray Scum Off every morning on our shower walls and floor. Reduces the number of times per year that we have to do a thorough cleaning. The product works very well for us. I know about this product from a envirogreen vendor expo in Seattle, drawn in by the live demo. After years using the few bottles I've purchased, I want to always have it around. It's easy to endorse a product when 1) it works this well and 2) I feel good about using it around my family. Really excellent product! I originally purchased this product at a home show 10 years ago. I have been using it ever since. I use it to clean the shower tiles...glass doors and my sinks....if I had a tub I would use it for that too. All you have to do is wet the area...use a rag or soft sponge and gentle rub the cleaner onto surface...then just rinse it all away. There are no chemical fumes or odors with this product. After using Scum Off only one time, I am sold on this product. I hate soap scum; I have used every other product that I can purchase locally; nothing has ever worked even close to my satisfaction. I purchased the 64 oz. bottle hoping it would prove to be worth the asking price, and I was most pleasantly surprised. This stuff works! It is superior to every other product I have have ever used by a substantial margin. I can recommend this to others because I plan to buy more myself. And I almost NEVER take the time to review a product for the internet. I bought this and WOW !!!!! is all I have to say it works amazing .... the one and only cleaner you will need for your glass shower doors BRAVO !!! I have tried so many products for keeping the shower clean of soap scum with poor results. THIS IS THE ONE! 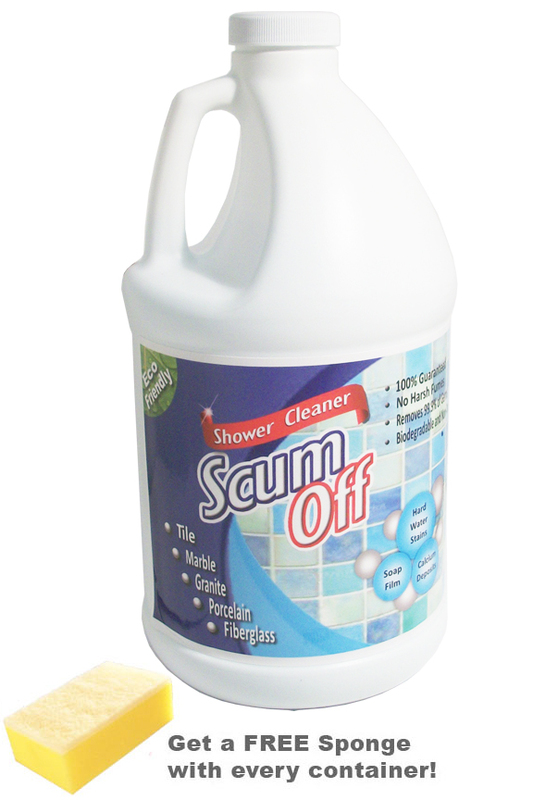 Scum Off is the best product I have found for this. It is a miracle worker for sure! I have been using it for over a year and I highly recommend anyone that has had that problem to try this, you will be sold. Thank you Scum Off!! Great for cleaning the grease off walls, floors, sinks, stoves.... I've not used it any other place yet. will your product work on travertine in the shower and the counter tops? Absolutely. It is perfect for natural stone surfaces. Gentle and effective. Absolutely! It's perfect for hard water and soap scum on glass. What is the difference between the Quick n Brite cleaner and the Shower Cleaner Scum Off? Scum Off has a stickier, more gel-like consistency, and it's specially formulated for the tough grime commonly encountered in bathrooms. I just bought it at the home show and it works great on a tube. But, will this product work on onyx shower? Yes. It's safe to use on virtually any bathroom surface, and you can definitely use on onyx without any worry. Is this a concentrate where you can mix it for spraying? What is the ratio for mixing? Yes. The cleaner is concentrated, and when making a spray with it, you will dilute into water. The exact mixture will vary depending on the job and strength required, but in general, it will be a few tablespoons or less for each quart of water. Does this work with iron rich water and remove the red from the shower stall? Will it remove old hard water stains fro glass shower door? We olready tried few cleaners and they didn't do it completly.And one more question. Some cleaners also protect surfase from getting those stains again. Is this cleaner does it too? Yes. It works well on glass shower doors. Once the surface is clean and free of any residue, it will help to keep it clean longer, and make it easier to clean when it eventually gets dirty again. My husband works in a machine shop and we get a nasty combination of typical soap scum, mixed with hard water, and the grease and aluminum dust from his hands, etc. I have so far found nothing that helps. Can I try Scum Off and if so, should I do something other than the regular instructions? We have a fiberglass one piece surround shower stall--no glass anymore--we gave up and got a shower curtain I can throw in the washer. I mixed a spray bottle with scum off to do the shower walls. Do I have to wipe it off after spraying or squeegee it off? Can I just spray and walk away? Help. For best results, you will want to wipe the surface clean, but make sure to let it sit for several minutes first. My problem with my shower doors is not so uch soap scum. My issue is more with hard water streaks. We also have a lot or iron in our water. Will scum off work to remove my streaking? Yes it will. It's formulated to remove both scum and hard water staining. Use as directed, and you should be pleased with the results. Will it clean my ceremic tile living room floor? Anything that I can't use this product on? Yes. You can use it on any tile surface, all throughout your home, and in general, it's safe to use on any hard surface that's safe to get wet with water. Yes it will. It allows for safe and effective cleaning of glass ranges. can you buy this in a store and if so where? 16 oz Scum Off - The smaller sized container of this cleaner. Quick'n Brite - A safe cleaning product for all over your home. All Cleaning Products - Find other safe and effective cleaning products. Bathroom Stuff - Discover more good stuff for your bathroom. Specially designed for cars, boats, dishes, counter tops and more! Amazing Scrubbing Power And Bristles That Don't Wear Out.